(Bloomberg) -- Ford Motor Co. could be close to getting junked again. That’s what the bond market is saying. The company’s debt is trading like it’s speculative grade, as investors worry about how higher steel tariffs and slowing sales will weigh on its profits. Ford is rated one step above junk by Moody’s Investors Service and two steps by S&P Global Ratings. Any downgrade could be painful for bond investors, and for the company. The automaker has more than $150 billion of short- and long-term debt globally, and is one of the 15 biggest corporate bond issuers in the U.S. outside the financial sector. Hedge funds turned in their worst monthly performance in nearly three years in the first part of 2005, when Ford was cut to junk along with General Motors Co.
Bob Shanks, Ford’s chief financial officer, said on an earnings call last month that the company is committed to maintaining its investment-grade ratings, and doesn’t intend to lose that status again. The company is “moving with a sense of urgency and taking proactive steps to redesign and restructure the business,” and over time "the market will recognize our progress,” spokesman Brad Carroll said. But debt investors are skeptical. The extra yield that money managers get for holding Ford’s 4.346 percent bonds due 2026 rather than similar Treasuries jumped to levels typical of high-yield companies. The cost of protecting Ford’s debt against default using credit derivatives rose in October to the highest levels since 2012 before settling down again. Moody’s downgraded the company in August to one level above junk, and said further cuts are possible in the medium term. Ford is fighting a “multiple-front war,” Peabody said, citing the company’s slowing sales growth in China and higher costs in the U.S. from global trade disputes. Ford fared better during the financial crisis than GM and the automaker now known as Fiat Chrysler Automobiles NV, avoiding bankruptcy and the government-backed bailouts that its competitors received. But losing its investment-grade status forced Ford to finance itself on a secured basis, essentially putting everything from its inventory to the rights to its oval blue logo in hock. When Ford reclaimed its investment-grade ratings in 2012, after it cut debt and profits jumped, Chairman Bill Ford announced the upgrade to employees on the public-address system normally used for fire drills in Ford’s Dearborn, Michigan headquarters. Now the company is facing difficulty again. Ford told investors in July it is launching an up to five year overhaul that could cost it $11 billion, as it focuses on higher margin products like trucks and sport-utility vehicles and exits businesses including its U.S. sedans. However, it has provided scant details on the restructuring plan, and has yet to reschedule an investor meeting that was originally set for September. Struggling operations in Asia and Europe prompted Ford to cut its 2018 profit forecast. The company posted about a 50 percent decline in earnings for the second quarter, followed by a nearly 40 percent decline in the third quarter. Its shares last month fell to their lowest level since 2009. Ford’s bonds trade at risk premiums similar to those of junk-rated companies in the auto industry, such as Allison Transmission Holdings Inc. and Dana Inc., and have since Moody’s cut the company to a step above junk in late August, according to Bloomberg Intelligence research. 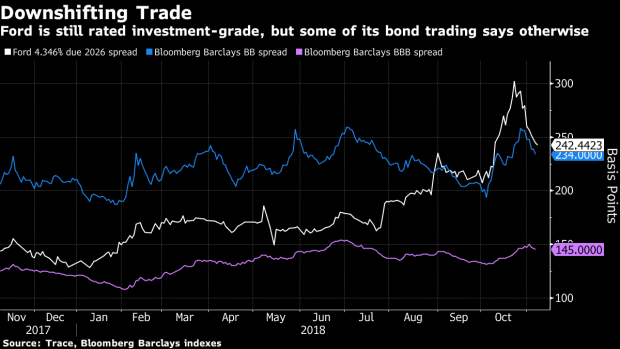 The bonds have rallied recently, but still trade at risk premiums higher than Fiat Chrysler, which is rated junk, and GM, signaling investors believe Ford is a bigger credit risk. One source of support as the company tries to fix itself is its cash position: Ford had around $35 billion of liquidity as of Sept. 30. That’s given comfort to credit raters, who have noted it as a positive. Earnings margins and operational challenges outside the U.S. are top concerns to Moody’s, which rates Ford Baa3. S&P and Fitch Ratings both rate the company one step higher at BBB. Ford would need to be cut to high yield by two ratings firms before it fell out of the investment-grade index. Many money managers don’t see that as likely, even if Moody’s decides to cut the company to speculative-grade, said Joel Levington, a former S&P director and now head of credit research for Bloomberg Intelligence. Ford has options for avoiding downgrades, Levington said, including cutting its dividend -- a step the company has insisted it won’t take -- or selling less profitable units. To some money managers, current trading levels represent an attractive buying opportunity. The company’s bonds pay high yields and the credit quality is relatively high, said Matt Brill, senior portfolio manager at Invesco Ltd.
“Ford generates a lot of cash flow and they have so much more flexibility than they did a decade ago,” with regard to costs, he said. But bond analysts caution that the debt is by no means a slam-dunk investment. Carmakers are cyclical businesses, and as the Federal Reserve raises rates, increasing financing costs for consumers, vehicle sales aren’t likely to improve much, if at all, from here. --With assistance from Keith Naughton.